The FAO study, African Agriculture: The Next 25 Years, stressed that Africa has considerable agricultural potential but that several constraints are preventing this potential from being exploited. If these constraints could be overcome, the continent could produce enough food, fuel and fibre to support a population very much larger than the 500 million people now living there. About 840 million hectares, 30 percent of Africa's land area, is potentially cultivable; less than one-third of this was actually being cultivated in 1980. Much of Africa's land base is environmentally delicate and easily damaged. Large areas of cropland, grassland, woodland and forest are already seriously degraded. A major finding of the FAO study was that the basis of Africa's agricultural production - its land - must be protected. Sustainable production, whether of crops, livestock or fuelwood, depends on systems of land use that maintain soil fertility and reduce erosion and other kinds of degradation. Erosion is a natural process that can never be completely eliminated, but it can be greatly reduced. Not until this is done can the sustainable agriculture advocated by the World Commission on Environment and Development (Our Common Future, Oxford University Press, 1987) be achieved. Over the centuries African farmers and pasturalists have developed effective systems of land use compatible with their environments, for example shifting cultivation in the humid tropics and nomadic grazing in the semi-arid areas. Farmers practicing shifting cultivation would clear an area of forest and then cultivate the land for two or three years. When plant nutrients in the soil were depleted, and crop yields had fallen, farmers would move to a new plot, leaving the old one to regenerate under natural vegetation. It could be 20 or more years before the original plot was cultivated again. In the meantime its fertility would have been restored by the bush or forest fallow, and weeds and pests suppressed. Nomadic pastoralists traditionally moved with herds of animals to different areas of good grazing and water supply as seasons and conditions changed. With low stocking levels they were able to move to new areas before the reserves of any single area were depleted and the soil laid bare. "To achieve global food security, the resource base for food production must be sustained, enhanced, and, where it has been diminished or destroyed, restored." These and other similar systems produced low yields - relatively large areas were needed to support a small population. Problems arose when populations started to increase, and the pressure on land resources became more severe. Unfortunately, new farming systems, which would increase sustainable production, have not been developed in many parts of Africa, and the old systems of land use have been retained. However there is now no longer enough land available to allow long fallow periods; more and larger herds compete for forage; and other traditional systems of land use are being placed under increasing strain. Farmers have responded by trying to develop new land although most of the best land is already in use and as a result expansion has largely been on to marginal land: steep land, land in areas of uncertain rainfall and land with poorer, erodible soils. In the process, large areas of forest have been destroyed and much traditional pasture put under the plough. Nutrient inputs are far below what is being removed. The nett result is severe degradation. 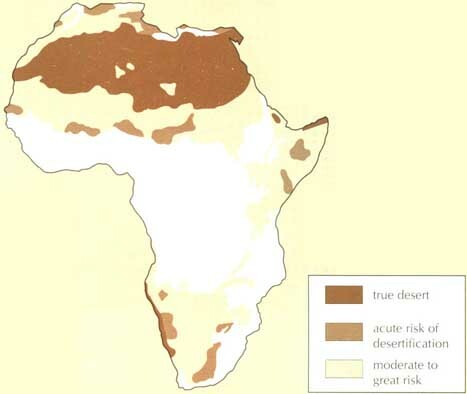 More than one-third of Africa is at present under threat of desertification (see map). On the southern edge of the Sahara some 650000 km2 of once productive land - an area the size of Somalia - have become desert over the past 50 years. An estimated 50000 to 70 000 km2 go out of production every year. These changes are worsened by periodic droughts but not caused by them; it is the mismanagement of the land itself that is causing desertification. Over-grazing also changes the composition of plants in the rangelands. Useless and mildly poisonous plants such as Calotropis procera now infest vast areas of the Sudano-Sahelian belt because they no longer have competition from the nutritious grasses that used to make up the bulk of pasture plants. In addition to over-grazing, the increasing use of trees and brushwood for fuel, leading progressively to deforestation, has accelerated desertification over much of semi-arid Africa. One result, found particularly in the arid and semiarid regions, is the desertification of land that was once productive and useful. As much as 34 percent of African land is now under threat from desertification (see box). Large areas of good land have al ready been buried by drifting sand, or the exposed topsoil has been blown away. Desertification can happen quickly, placing large numbers of people at great risk. During the Sahel drought of the early 1970s, nearly one million 'environmental refugees', a sixth of the population, were forced to leave Burkina Faso. Half a million more left Mali. At present deforestation is proceeding 30 times faster than reforestation. In the early 1980s an estimated at 3.7 million hectares was being lost each year. The destruction of the forests is mainly a result of clearance for agriculture. Both traditional techniques of slash-and-burn agriculture and permanent clearing for modern farms are taking their toll. The search for fuelwood, as well as the growing frequency and severity of forest and bush fires, are also taking their toll. Deforestation has led to a crucial shortage of fuelwood and building materials in many areas. Crop residues and animal manure, which were previously returned to the soil to add valuable nutrients, are having to be burnt for fuel. At the same time, the ploughing of pasture has forced herders to move further into the marginal areas where their animals destroy the vegetation and land degradation is accelerated. Hydrological conditions over much of Africa are being changed. With less vegetative cover to protect against the impact of raindrops causing surface sealing, less rain infiltrates the soil. Runoff increases, stream flows fluctuate more than before, flooding becomes more frequent and extensive, and streams and springs become ephemeral. These conditions encourage erosion; as a result, sediment loads in rivers are increasing, dams are filling with silt, hydro-electric schemes are being damaged, navigable waterways are being blocked and water quality is deteriorating. The inland fish catch is suffering in many areas. With less water entering the soil and being stored for use during dry periods, crop yields are also falling. FAO studies indicate that more than 35 percent of land north of the equator is affected by either erosion or salinity. Zimbabwe alone could be losing, on average, 1.6 million tonnes of nitrogen and 240 000 tonnes of phosphorus each year though erosion (see box bellow). A 1987 FAO study suggested that sediment in many African rivers is increasing roughly 1.5 times as fast as the populations in their catchment areas. Thus sediment levels are increasing at approximately 5 percent per year in Nigeria, Tanzania and Zimbabwe, 4.3 percent in the Sudan and 3.2 percent in Tunisia. Large dams in Morocco currently provide 500 million m3 of water for household and industrial use, irrigation water for 600 000 hectares and 1 500 GWh of energy a year. Siltation of Morocco's reservoirs is reducing the available water by 0.4 percent - 40 million m3 - a year. So far, 6 percent of installed capacity - some 600 million m3 of water, enough to irrigate 60 000 ha - have been lost to sedimentation. Major reservoirs such as Mohamed V on the Moulouya River - where 10 million m3 of water are being lost annually - will be entirely filled in by the year 2030; others reservoirs are likely to become useless in as little as eight years. Dam heights on three of Morocco's major dams have already had to be increased to preserve storage capacity. To maintain current levels of water storage in Morocco now requires the construction of one new reservoir storing 150 million m3 of water every year. Recent work by FAO on data gathered in Zimbabwe gives an indication of the extent and cost of the soil nutrient lost in that country. In 1986, a computer was used to reanalyse erosion data collected nearly 30 years ago in an important series of experiments conducted at Henderson Research Station in Zimbabwe. The enrichment ratios, the measure of how much more concentrated a nutrient is in the material removed by erosion than it is in the soil from which it is taken, averaged about 2.5. This means that there is considerable selective removal of nutrients from the soil by the erosion process. An extrapolation of these findings to national level suggests that erosion carries away an annual average of 1.6 million tonnes of nitrogen, 15.6 million tonnes of organic matter and 0.24 million tonnes of phosphorus. On this basis, the arable lands alone lose 0.15,1.5 and 0.02 million tonnes respectively each year. Nitrogen and phosphorus losses from the arable land were about three times the level of total fertilizer applied in Zimbabwe in the 1984/85 season. If fertilizers were applied to compensate for these losses, the cost would have been US$ 1500 million per annum in 1985. Thus, the financial cost of erosion per hectare per year varied from US$20 to $50 on arable land and from US$10 to $80 on grazing lands. The implication of these figures is that erosion is a massive "hidden" cost on the economy of Zimbabwe - as indeed it must be in nearly every other African country. 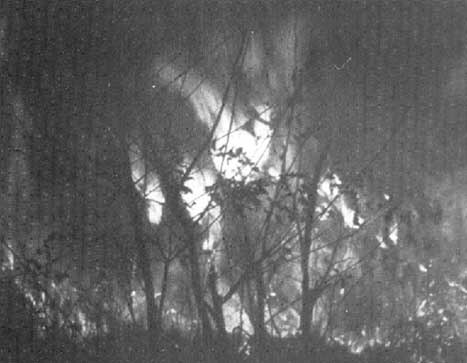 The degradation of valuable bush and woodland as a result of forest fires is now a serious problem in many semi-arid areas. Such conditions lead directly to human suffering and misery. Land stripped of most of its topsoil and vegetation, can produce little even when rainfall is adequate. Whereas in the past, farmers were able to harvest some production even after seasons of low rainfall, now they frequently harvest nothing and there are insufficient reserves of vegetation to carry livestock through poor seasons. This is now the position in Ethiopia, where recent famines can be at least partly blamed on land degradation. Unless the present trend is reversed, many other African countries may soon be placed in the same situation.